Last night (Friday 27th February 2015) was the 4th Summer activation event for the VK5 National and Conservation Parks Award. So I headed out to the Onkaparinga River National Park, which qualifies for both the VK5 Parks Award and also the World Wide Flora Fauna (WWFF) program. The park is VKFF-402 in the WWFF program. I set up near Gate 3 and the Bakers Gully track. There is a good carpark here where you can park off Chapel Hill Road. Just a short walk of 20 off metres is a wooden table and benches, which makes a great ‘shack’. The scrub here is a bit thick, but there is enough room to string out a dipole which is exactly what I did. For this activation I ran the Yaesu FT-857d, 40 watts and the 40m/20m linked dipole, supported on a 7 metre telescopic squid pole. It was quite a warm afternoon, about 28 deg C, so the shade provided by the gum trees was very welcome. Prior to calling CQ I had a look around the 40m band hoping that I would find some of the other park activators. And it wasn’t long before I did. 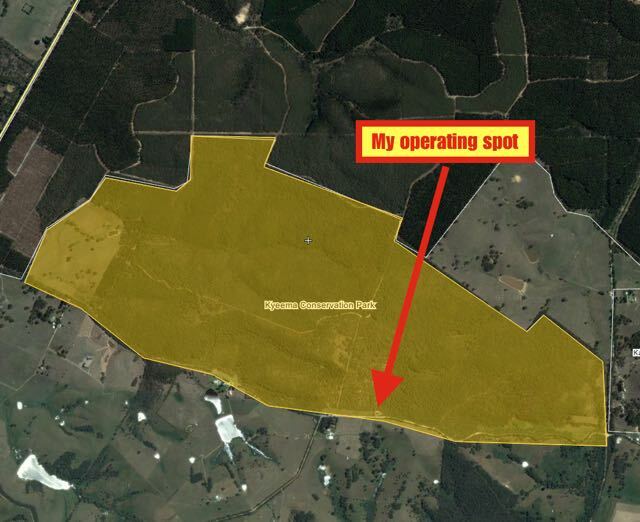 My first contact was with John VK5BJE who was operating portable from the Scott Creek Conservation Park on 7.100. John had a lovely strong 59 signal. I then found Tom VK5EE in the Gower Conservation Park in the South East on 7.088. Tom was also 59 and was conducting a joint activation with Col VK5HCF and new park activator, Alan VK5FAJS. It was great to get Alan in the log. Welcome to the world of park activating Alan. 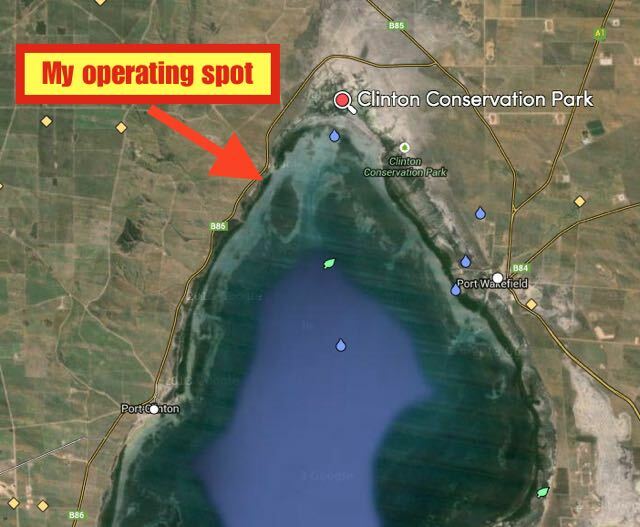 My next contact was with another new park activator, Adrian VK5FANA, who was in the Clinton Conservation Park on the Yorke Peninsula. Adrian was operating from near Port Arthur, and had a very nice 5/9 plus signal to Onkaparinga River. This was a great start to the activation, five park to park contacts. I then headed up to my nominated operating frequency of 7.144, but found that there was a lot of activity on either side, so I settled for 7.142 and started calling CQ. In fact there were 2 G stations on 7.138 having a chat amongst themselves. They were not very strong, but very readable. But I didn’t call them as I wasn’t confident that they would hear me. 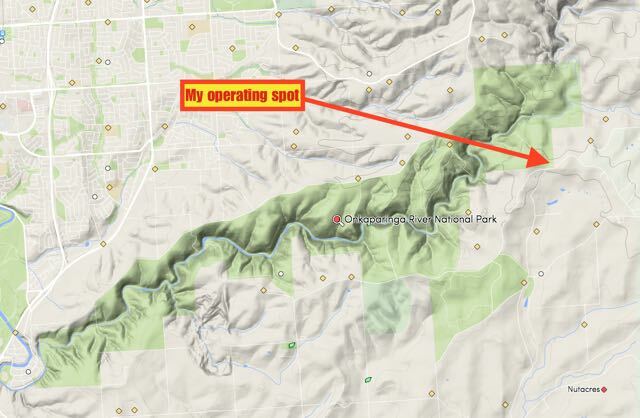 My CQ call was answered by Marc VK3OHM who has recently become an avid park hunter, followed by another park to park contact, this time with Chris VK4FR/5 who was portable in the Morialta Conservation Park. Although Chris was running QRP, his signal was still 59 to me. 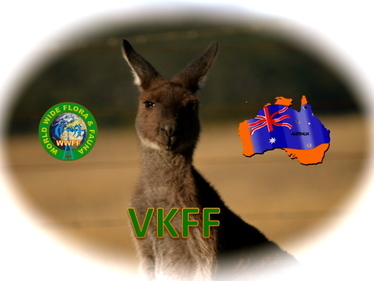 I went on to work a number of stations in VK3 & VK5, including Mick VK3PMG who has recently upgraded his call (formerly VK3FAFK). Well done Mick. When things slowed down I took the opportunity of QSYing and having a look around the band. I found Richard VK5ZRY on 7.110 calling CQ from the Ramsay Way Conservation Park on the Yorke Peninsula. I wasn’t expecting Richard to be out and about so this contact was a nice surprise. I then worked Les VK5KLV who was portable in the Winninowie Conservation Park, south of Port Augusta. I then lowered the squid pole and removed the links in the dipole, so I could try my luck on 20m. The WWFF program is very popular in Europe, so I was hoping to work some of the European park hunters. I headed to my nominated operating frequency of 14.244, however there was activity either side including a G station calling CQ on 14.245. So I headed up to 14.250 and started calling CQ. But unfortunately the same G station had followed me up the band and started calling CQ on 14.251.5, just above me. Strike two! I then moved up to 14.267 and started calling CQ again and this was answered by David VK5ADO with a very loud signal. This was followed by a small group of European park hunters including F5TJC, DJ8QP, I5FLN, IZ2IHO, F1BLL, EA3MP, F2YT, DK0EE, EA1DFP, HA6OB, S52KM, ON4BB, and DK4RM. Conditions were challenging to say the least. Many thanks to my old mate Larry VK5LY for spotting me on the DX Cluster. This certainly alerted the European stations to my presence in the park. I also managed a few other VK contacts which included Andrew VK2AC, John VK5BJE in the Scott Creek Conservation Park, and my mate Greg VK8GM in Alice Springs. Prior to heading back to 40m, I had a quick listen around the 20m band. I’m very pleased I did, because I managed to work VK9LC on 14.199 on Lord Howe Island. But the cream on the cake was a contact with Jerry PH9HB who was aeronautical mobile above the Canary Islands. Jerry was a good 5/7 and he gave me a 4/4 with my 40 watts. I have worked Jerry before whilst he has been in the air, but those contacts have been from home. So this was a very exciting contact. I then headed back to 40m, where I spoke with Geoff VK5HEL on 7.093, who was portable in the Ferries McDonald Conservation Park. Geoff had a beautiful 59 signal from the Murray Mallee. I then QSYd to 7.144 and called CQ and this was answered by Perrin Vk3XPT who was portable in the Alpine National Park, running QRP 5 watts from his Yaesu FT-817 and an end fed 1/2 wave antenna. Perrin was camping near Mount Buller and had a nice 59 signal. I worked a further 11 stations in VK2, VK4 & VK5. This included Tom VK4FAJB at Hervey Bay, who only received his licence in the mail the day prior. Welcome to amateur radio Tom. The drizzly rain had just started at this time, and it would continue on and off for the rest of the activation. There were about five occasions when I had to drive underneath the bothy bag. Again when things slowed down a little I had a look around the band. I found Chris VK5FR/5 having a chat with Adrian VK5FANA who was portable in his second park, the Wills Creek Conservation Park. After having a quick chat with Chris, Adrian came up asking Chris if he could quickly work me, to which Chris obliged. It was great to get Adrian in the log from his second ever park activation. I then spoke with Peter VK3YE who was pedestrian mobile at Port Phillip Bay. Peter regularly goes pedestrian mobile and it never ceases to amaze me with the signal he puts out. This evening was no exception, 5/8. I then found Phil ZL2RO calling CQ on 7.167 from Hastings in New Zealand. Phil had a very good 5/9 plus signal. Following my contact with Phil, it was 8.00 p.m. local time (0930 UTC) so I headed to 7.130 for the 7130 DX Net. On the net I had a total of 17 contacts including Bill W1OW in Massachusetts in the USA (5/7 sent & 5/5 received), William FO5JV in French Polynesia (5/8 sent and 5/5 received), Brian ZL2ASH in Wellington new Zealand (5/9 both ways) and Phil (VK2MCB) operating special event station VI110ROTARY for the 110th anniversary of ROTARY. I also spoke with Andy VK4TH/8 who was sitting back enjoying the sunset in the Uluru-Kata Tjuta National Park in the Northern Territory. Above: underneath the bothy bag. Just prior to the closure of the net, I QSYd up to 7.135 and started calling CQ. This was answered by Steve VK5SFA. I went on to work a further 11 stations on this frequency, in VK2, VK3, VK4, VK6, & VK7. All with excellent signals. I then decided to see what propagation was like on 20m, specifically the Southern Cross DX Net. Once lowering the squid pole again, removing the links, and putting the squid back into place, I tuned to 14.338.5 and heard the Net Control, Jack W1FDY in Virignia, with a good strong 5/8 signal. Surprisingly Jack was able to hear me quite well. He gave me a 5/6 signal report. I went on to work a further 5 stations on the net: Reg VK6BQQ, Peter VK3CFA, Peter KD2BMX in new York, Bill W1OW in Massachusetts, and Al K4AWM in Virginia. Unfortunately I had to go QRT in a hurry, as the rain really started to come down heavy. This was a very enjoyable activation, with a total of 87 contacts in the log. This included 13 S.A. park to park contacts, two Victorian National Parks and one Northern Territory National Park. 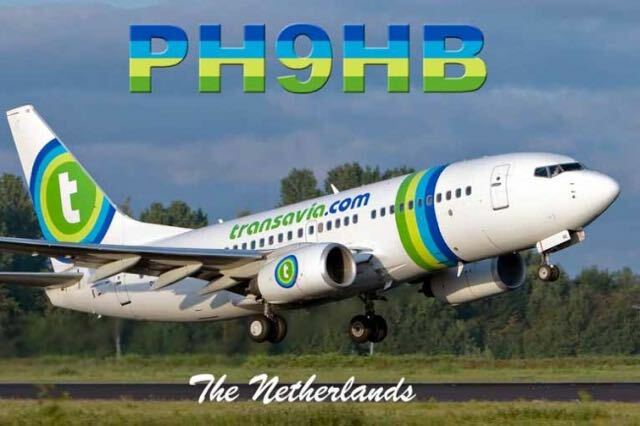 And also some interesting DX contacts including the contact with Jerry PH9HB aeronautical mobile. On Friday evening (13th February 2015) I activated the Kyeema Conservation Park, as part of the 3rd Summer afternoon/evening activation event for the VK5 National and Conservation Parks Award. Yes, it was Friday, the 13th. But fortunately I did not come across any scary monsters or demons in the park. I did however, bump into another amateur, as you will read a little later. 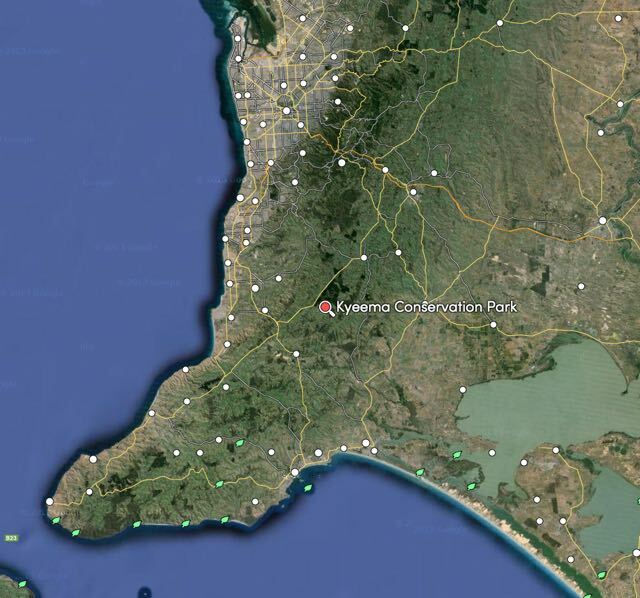 The Kyeema Conservation Park is situated about 60 km south of Adelaide, and is easily accessible via Woodgate Hill Road, which runs off Brookman Road (the main road between Willunga and Meadows). The park has a rich history, which includes alluvial gold mining, and a labour prison reserve. The area was devastated during the 1983 Ash Wednesday fires. I have activated the park a number of times in the past. It is an ideal park for a night time activation, as there is a good cleared area between the road and the scrub, alongside of the carpark off Woodgate Hill Road. This area is on the western side of the carpark, near Gate 3. The gate is locked, but the wire fence alongside of the gate is easily negotiated. I set up the fold up table and deck chair and I was ready to go by 6.15 p.m. S.A. local time. It was a beautiful evening, with the temperature being a very comfortable 25 deg C. It was very overcast with some very threatening black clouds in the sky. It had been a warm day in Adelaide, getting into the mid 30’s. But not as hot as expected. Unfortunately, the very hot weather predictions, had put off a lot of other park activators from venturing out this evening. Before calling CQ, I had my normal scout around the 40m band to see who I could find, and to gauge what propagation was like. The 40m band seemed to be in good shape, with lots of signals coming through, but there were a lot of static crashes. 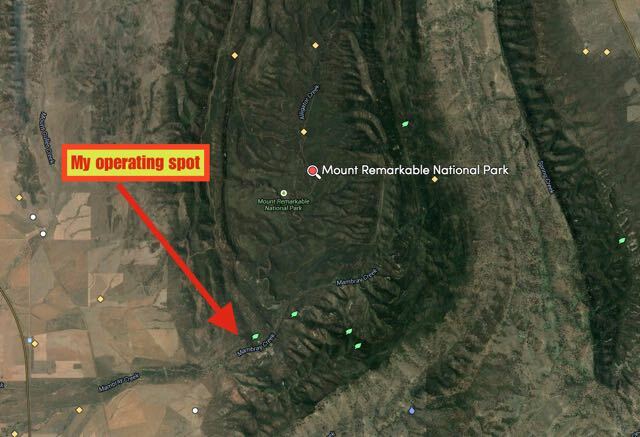 I found Bob VK5FO calling CQ on 7.090 from the Morialta Conservation Park. Bob had a beautiful 5/9 signal coming into the Fleurieu, and it was a great way to start the activation with a ‘Park to Park’ contact. I then moved up to 7.097. There was some activity on 7.093, so I could not get onto my nominated operating frequency of 7.095. My first taker after calling CQ was Hans VK5YX. Hans had been out a little earlier in the afternoon in the Hallett Cove Conservation Park. But unfortunately this time around, I had missed Hans whilst he was out in a park. Another regular park hunter then called in, Arno VK5ZAR. Arno normally heads out to activate on the Summer activation events, but this evening he had a club meeting to attend. I was then called by Adrian VK5FANA on the Yorke Peninsula, running QRP 5 watts with a nice 5/9 signal. Adrian seems to have been bitten by the ‘QRP bug’ and he does very well with his low power. Unfortunately, the same ‘offenders’ that I had experienced last week whilst operating portable, came up on 7.098 whilst Adrian and I were in the middle of a QSO. They are VK2’s who appear to have a regular sked on 7.098 and speak in Italian. They were just too strong to compete with, and were bleeding over badly. Despite being told by some other stations to QSY, as per last week, they appeared to ignore this and kept on going. So again, as per last week, I QSYd. I moved to 7.115, and my first taker there was another park regular, Les VK5KLV at Port Augusta. This was followed by Ian VK5CZ who had a hard day in the vineyard in the Clare Valley, and had to get up again at 4.00 a.m. Keep boxing on Ian!. And then another regular WWFF park activator and hunter, Rob VK4FFAB, gave me a call, followed by Brett VK4FTWO in Bundaberg. A few QSO’s later I was called by Doug VK2FMIA, who is another keen park atcivator and hunter. And then a few calls later, Geoff VK5HEL called in from the Mowantijie Willawaur Conservation Park. This was a real surprise. I wasn’t aware that Geoff was heading out. I have activated Mowantijie before, but this was the first time I had got the park as a Hunter. Great, another ‘Park to Park’. Tom VK5FTRG from Millicent gave me a shout a few contacts later. 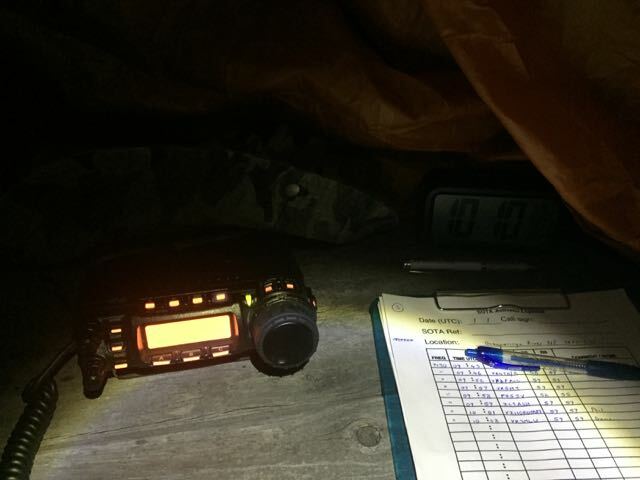 Tom often runs QRP, and tonight was no exception. With just 1 watt, Tom was 5/9 to Kyeema. Although, when he was running the processor on his transceiver, his audio was pretty average. But when it was switched off, the audio was lovely. A few calls later I spoke with Phil VK2HPN who was mobile near Canberra on his way home from work. Phil told me that he follows my WordPress site and had been trying to work me for a few years. I was quite humbled by Phil’s comments, and I was very pleased to make contact with Phil. This was followed by a call from Gary ZL3SV on the North Island of New Zealand. Gary is always one of the strongest signals on the band. Have a look at his antenna on QRZ.com and you will see why…..
And then a few QSOs later, I was called by Mike VK6MB. Mike was a nice 5/9 to Kyeema, and he reciprocated with a 5/7 signal report for me. This time of the evening is ideal to work into Western Australia on 40m. And to keep the good contacts rolling, a few QSO’s later I was called by my mate Andy VK4TH/1 who was portable near Canberra. Andy is on a road trip and I will be catching up with him in a week or two for a meal and a few beers. Andy was camping on the side of the Huon Highway near Canberra, and had a beautiful 5/9 signal. I took a break from the radio and took the opportunity of taking some photos and having a drink. The Yellow tailed black cockatoos were out in large numbers in the park, along with numerous Superb Blue Wrens. I returned to the radio and had a bit of a tune around the 40m band and found K1N on Navassa Island, working split. He had quite a good signal, but the pile up was unbelievable, with lots of VK’s, USA, & Japanese stations trying to get through. It certainly would have been nice to have worked them, but I didn’t even try. Whilst operating, I had a car arrive in the carpark. As the male occupant got out of his car, he had a close look at the antennas on my car. He then walked towards me, and said hello, and kept walking off into the bush. A few times, he looked back in my direction, but kept walking. I thought, yep another guy probably wondering what the hell I was doing. Time passed, and the guy reappeared. This time he said hello, and introduced himself. It was Rafe VK5FRAF. Unbelievable. I’m in a Conservation Park, a fair way from anywhere, and I bump into another ham. Rafe told me that he had been licenced for about 6 years but was not very active. We had a good chat and exchanged phone numbers. 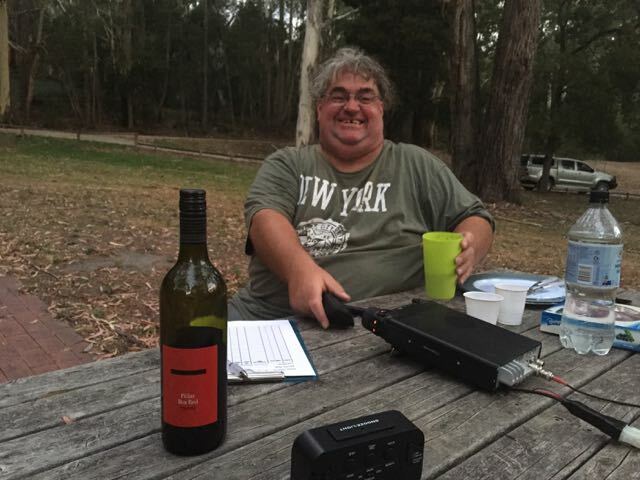 Hopefully, Rafe will be attending the next meeting of the Adelaide Hills Amateur Radio Society. I then joined the 7.130 DX Net which was being run on 7.140, as K1N was working split on 7.130. On the net I made a total of 9 contacts, including Caleb ZL2ML, Brian ZL2ASH, and ZL1CBE. Just as the Net was about to finish, the Indonesian QRM commenced, along with the Over the Horizon Radar (OTHR). So after a few very enjoyable hours at Kyeema, I had a total of 41 contacts in the log. It was 9.30 p.m. and still 20 deg C. A beautiful evening. 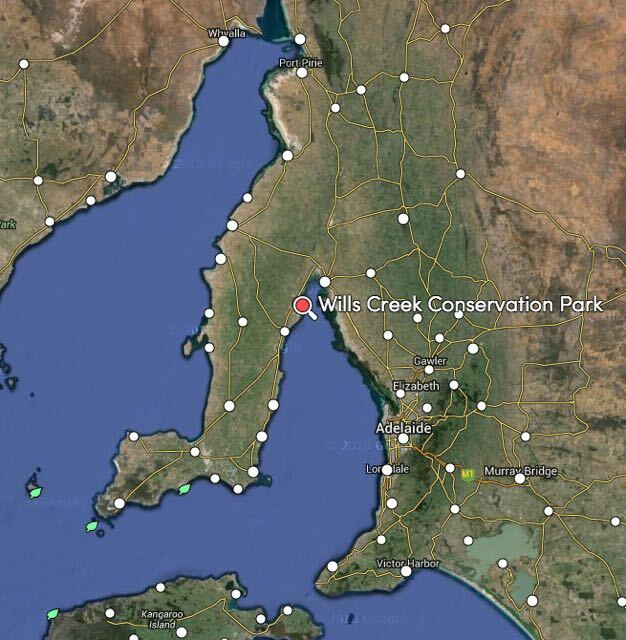 My last activation for my 4 days away was the Wills Creek Conservation Park, which is located near the little town of Price, about 132 km from Adelaide, on the Yorke Peninsula. The Wills Creek Conservation Park was proclaimed in 2006 and is 1,130 hectares in size. It is situated at Mangrove Point on the north western shores of Gulf St Vincent. It is a significant coastal wetland and estuary area supporting mangroves and intertidal habitats. The park extends south from the township of Port Clinton to the town of Price. The park consists of mangrove and samphire habitats along the coastal fringe. Wills and Shag Creeks are known fish nursery areas and as an important habitat for sea birds. I travelled to the end of the Causeway Road, leading out of Price, and set up at the boatramp on Wills Creek. It was now very hot. My temperature gauge showed 38 deg C. So I quickly set up the gear and sought refuge in a little wood and tin shelter in the carpark, near the Creek. I called CQ on 7.095 and this was answered by Greg VK5GJ at Meadows, running his normal QRP 5 watts. Greg’s signal was 5/4 but extremely readable due to the very low noise floor in the park. My second caller was Brian VK5FMID in Mount Gambier, followed by Nev VK5WG at Crystal Brook, and then Mick VK3FAFK in Stawell in western Victoria. I went on to work a further 16 stations in VK3 and VK5. This was a quick 25 minute activation. I had a total of 20 contacts in the log. 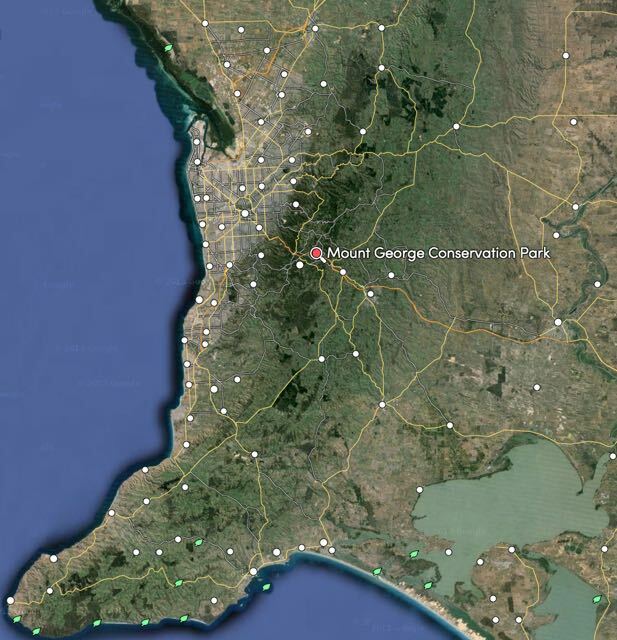 Department for Environment and Heritage, 2009, ‘Mainland Conservation Parks of Yorke Peninsula’. I was now on the downhill run of my 4 days away. 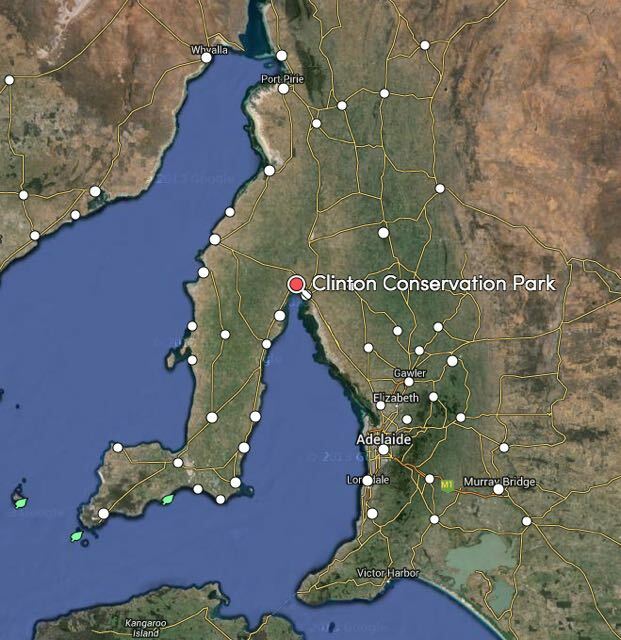 My first park for Friday the 6th February, 2015, was the Clinton Conservation Park, which is located about 100 km north of Adelaide, near the town of Port Wakefield. The Clinton Conservation Park was established in 1972, and is 1,923 hectares in size. It is a boomerang shaped park, which is situated at the northern extremity of Gulf St Vincent. 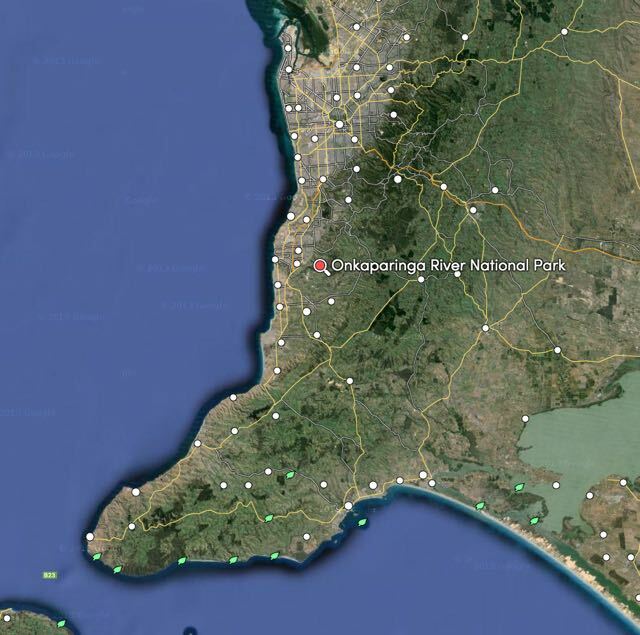 It stretches around the top of the Gulf from just north of Port Wakefield, around to the little town of Port Clinton on the Yorke Peninsula. The park comprises an expanse of mainly low-lying, coastal-fringe habitats, with mangroves and samphire communities, and extensive tracts of intertidal mudflats. It is an important refuge as a fish nursery and a significant site for migratory wading birds. I found a nice quiet little track off the Yorke Highway, which took me right down to the water’s edge. I set up the fold up table and deck chair and then the linked dipole. This was going to be a quick activation, as the expected temperature today was 38 deg C. It was already approaching the mid 30’s and it was 9.30 a.m. There was no shade at this location, but I was facing the sea, and there was a nice cool breeze coming in off the Gulf. The area was alive with bird life. Of the feathered variety! There were Pelicans, Silver Gulls, Pacific Gulls, and Sandpipers. I ran the Yaesu FT-857d and 40 watts for this activation. I started off on 40m, where my first contact was with Mick VK3FAFK in Western Victoria. This was followed by Adrian VK5FANA operating QRP 5 watts, and then Jim VK5JW on the Eyre Peninsula. The voice of the Mid North then called in, Nev VK5WG, also operating QRP 5 watts. A few QSOs later, another familiar QRP caller gave me a shout, Greg VK5GJ at Meadows in the Adelaide Hills. I also worked Robin VK5TN who was mobile at the Blue Lake in Mount Gambier. I did try calling CQ on 14.317 but had no takers. Whilst having a break from my CQ calls I heard a very distinct burst of noise on the 20m band. Initially I thought there was a problem with the antenna, but not so. It was across the entire band. Most likely a flare or CME. The noise settled down after a minute or so. 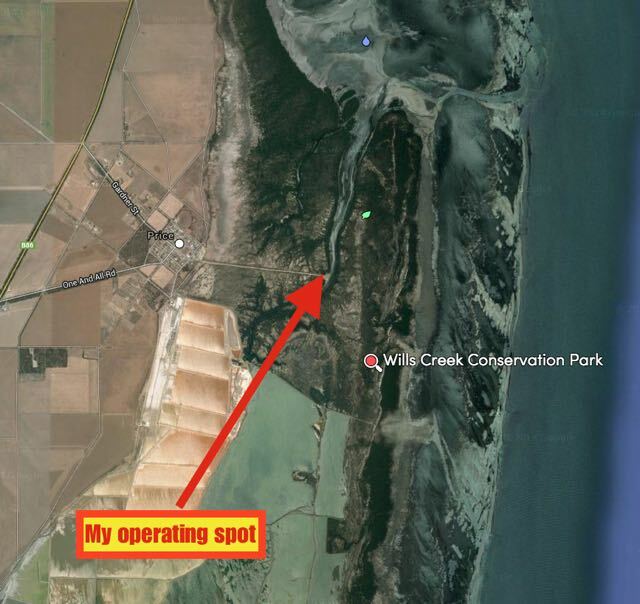 But it was just getting far too hot out in the sun, so I packed the gear up after getting a total of 13 QSO’s in the log, and headed further south on the Yorke Peninsula to my next park, Wills Creek Conservation Park.